This is the weekend where the world waits. Waits for the outcomes of the Greek, Egyptian and French elections. What I find interesting is the anticipation that by Monday something will happen, something will change. The market is looking for an indication, a sign for the future and everyone is trying to get a drop on the next direction. But is that reasonable? Perhaps not. The reason is that no matter what the outcome is, it will take years for any direction to unwind. (“Rome was not built in a day” nor will it be torn down, sorry I couldn’t resist.) Some pretty knowledgeable people figure that it would take 1 trillion Euros to “bail out” the Euro zone, and also 1 trillion Euros to break it up. There are no easy choices here. Germany and the northern countries are between a rock and a hard place. The EU is an export benefit for them but now it could also be expensive to maintain it. Enough. This is a tech blog. The chart above does show (tentative) promise. I see a sell off, a rally, a re-test then a move up on high volume (last Friday, circled in red) and breaking the upper trend line. What we should watch for is a break above resistance near the 2882 level with strength. The wide-spread bar on high volume on Friday was nice, but Friday was an options expiration day so volume could be just a little artificial. My market models do confirm some positive movement here so watch and be careful. The Accumulation and Distribution chart above also shows improving conditions, although slowly. 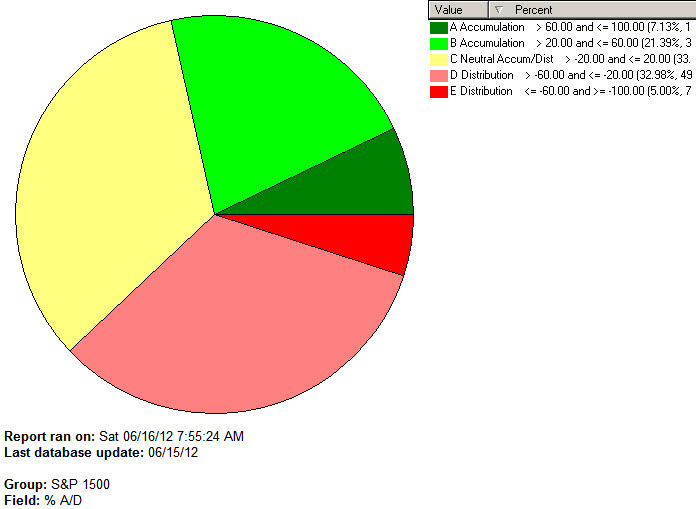 The slices of green are getting larger but there is still large amounts of Distribution and Neutrality to work though. Now may (just may) be a good time to be drawing up a watch list of stocks to consider. 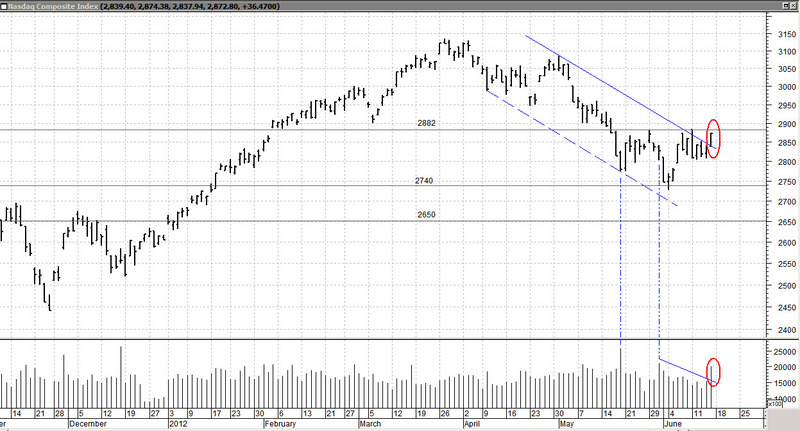 Anything out there that could be breakout out to the up side ahead of the market? Biotech., Healthcare, select technology stocks? Just some thoughts to ponder. I’ve taken positions in a few and will consider more as the market confirms or denies this brief up ward move. A wise person once told me “Tom . . . where is the greatest risk, at the top or the bottom?” Another idea to ponder. Have a good week and be extra watchful as the next few days unfold. It may be time to act . . . or not. Please feel free to comment and share my comments with others. Clicking on the charts will enlarge them.